The passing away of Sir Colin Davis has been announced, prompting some heartfelt, poignant and fond tributes from the classical music world. Nicholas Kenyon, Managing Director of the Barbican Centre, described Sir Colin as one of the great musicians of the last half century. "He's been so much a part of our musical lives that its quite difficult to imagine him not there," he said. 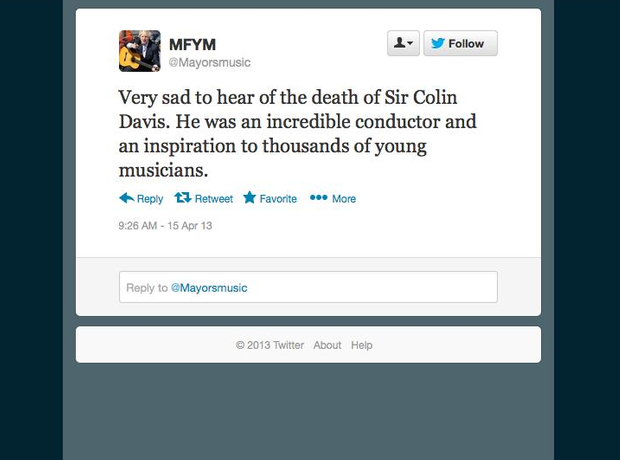 "One thing I'd particularly like to remember is his commitment to young people and their music making. He was absolutely tireless in trying to show that young people had innate musical talent, and that it could be brought out of them." "He was the most significant conductor of the last half-century, [and] was widely regarded as a conductor of exceptional capabilities across a whole range of music."